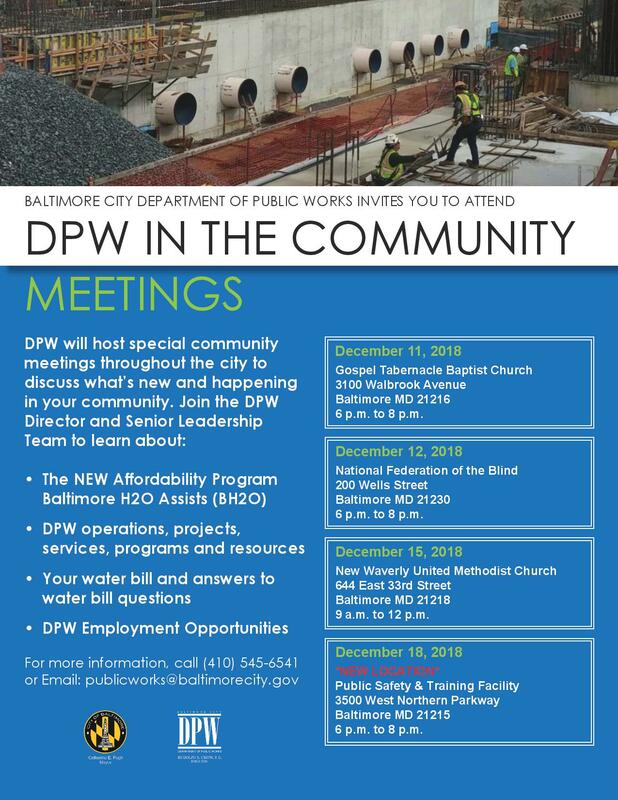 Starting this December, the Baltimore City Department of Public Works (DPW) will hold a series community meetings throughout the City. The first community meeting will be Tuesday, Dec. 11 at the Gospel Tabernacle Baptist Church, 3100 Walbrook Ave. from 6 p.m. to 8 p.m.
At the community meetings, you will get a chance to learn about the work we are doing throughout the city — at Druid Hill Park and at Lake Ashburton along the Liberty Heights corridor in the northwest part of the city. In addition, residents will have an opportunity to discuss water and sewer service and bills. Plus, you can share your trash-related questions. DPW Director Rudolph S. Chow, P.E., will lead the “DPW in the Community” meetings. He will be joined by the Department’s senior leaders and members of their staff. They will be on hand to answer your questions and share information about what their divisions are doing to serve Baltimore City residents. Residents can call the Division of Communications and Community Affairs for more infortmation, 410-545-6541.